Patrolman Ryan Polniak and his K-9 Partner Schuyler attended the Dodge Drugs Dodgeball day hosted by the Ogdensburg Elks Lodge on Saturday, March 30th. 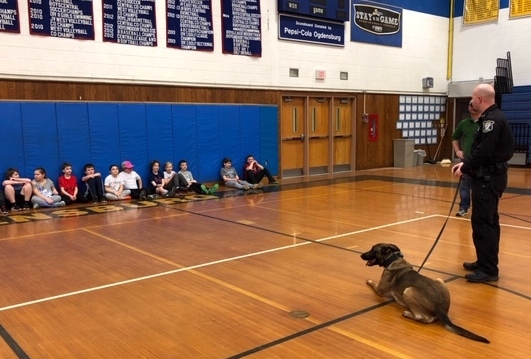 Patrolman Polniak talked about the job that he and his partner do as a K-9 team and how Schuyler is utilized both by patrol and investigations within the department. The police department's K-9 program has become an invaluable tool in our efforts to combat illegal drug activity in our community.